Diamond Mine Deluxe Classic Slot Guide & Review - Casino Answers! 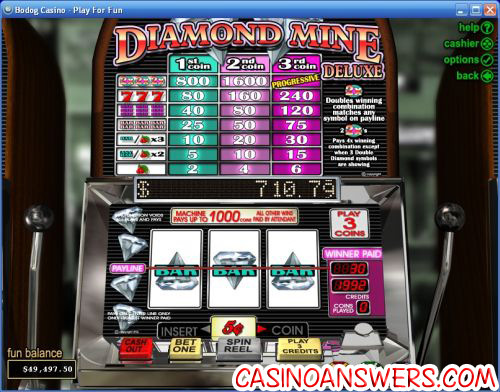 Diamond Mine Deluxe is a 3-reel, 1-line classic slot machine from Realtime Gaming, featuring wild substitutes, nudging and a progressive jackpot. You can play Diamond Mine Deluxe at Bovada.Play at this years #1 online casino for United States - Slots.LV. Diamond Mine Deluxe’s game buttons are across the bottom; the button at the very left is the “Cash Out” button. You can press this button at any time to cash out. They will be converted into cash automatically. The next button to the right is “Bet One.” Press this to bet a credit. You may bet up to 3 credits. If all 3 credits are bet, this button will dim. The next button over is the “Spin” button. This will be only light up if credits have been inserted first. Finally, there is final button says “Play 3 Credits” which is also known as “Bet Max” on other slots. This will always remain lit up. If you press this button, you will automatically spin the reels with 3 credits. Above the game buttons is the face of slot machine. Above the reels is the progressive jackpot. As you play Diamond Mine Deluxe, you will see the progressive jackpot slowly increasing. Below it, it will say that the machine only pays up to 1000 coins and that malfunction will void pays and plays. These messages are just here to simulate a real life slot and are not to be taken seriously. If you look to the right of the reels, you can see how many credits (or coins) you have, how many credits you have on the last spin and how many you have won. To get started on Diamond Mine Deluxe, you must select a chip. There are denominations of $5, $25 and $100 available to you. Diamond Mine Deluxe is a nickel slot. Therefore, $5 will buy you 100 credits, $25 will buy you 500 credits and $100 will buy you 2000 credits. You can buy more credits at any time. Once you’ve bought your credits, you have the choice of betting one, two or three of them per spin. To be eligible for the progressive jackpot, you must bet three credits. Once you have selected your bet, hit “Spin Reel.” As the slot machine is played, you will hear sound effects, finishing with clicking noises once the reels finish spinning. Any winning combinations across the center payline will be paid. Diamond Mine Deluxe has additional motivation for betting three credits on every spin you make. There is a nudge feature, somewhat like those found on fruit machines. If you spin using all three credits, bar symbols with diamonds that are pointed up or down will move in that direction, often creating a new winning combination that you would not have received otherwise. Payouts are determined by the paytable. The paytable can be found at the top of the Diamond Mine Deluxe slot machine. Look at the column that corresponds to the amount of credits you have bet. As an example, if 2X symbols appear on a 2-coin bet, you will win 1,600 credits. If you manage to hit three 2X symbols on a 3-coin bet, you will win the progressive jackpot. The 2X symbols act as wild symbols. They have the ability to complete winning combinations in place of any other symbols. They are easily the most-desired symbol on the Diamond Mine Deluxe slot machine. Diamond Mine Deluxe takes its predecessor and ups the ante even more. It combines the charm of a classic slot machine and adds some of the features more commonly seen on more advanced slot machines, making it in many ways the best of both worlds. You can play Diamond Mine Deluxe, Diamond Mine and several other classic slot machines at Bovada. Can I find a US-friendly casino to play Diamond Mine Deluxe at? Lucky Red Casino and most other RTG casinos are open to USA players. Diamond Mine Deluxe has a greater progressive jackpot, a nudge feature and wild symbols. You can also play the original Diamond Mine classic slot machine at Bovada. Where can I get the best bonus to play Diamond Mine Deluxe? If you’re looking for a huge signup bonus, we suggest you head over to Lucky Red Casino to get a 400% up to $4000 signup bonus! Where can I play the Diamond Mind slot machine? What is the dynamic mine slot machine game? Is there a deluxe version of Diamond Mine?